The show, sponsored by Vick's, begins with the romantic bachelor singing about him being a romantic bachelor. "A romantic bachelor am I", he sings. The theme song promises the bachelor is planning to steal the listener's heart with his stories and disarm her with love songs. Romance is the show's theme. It featured romantic love songs loosely held together by a bit of story between the songs. The stories feature the un-named bachelor telling about how he came to fall in love with object of his affection. The songs ran the gamut from religious hymns to popular songs from the 19th century and 20th century. 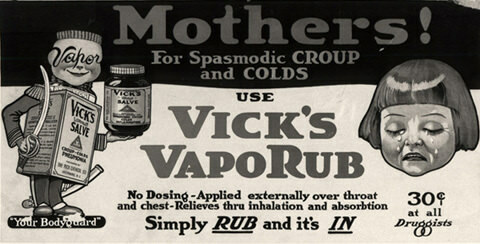 Somewhere in the 15-minute show Vick's worked in an advertisement for Vick's Vaporub or another Vick's product. The show stars Harold Betts as singer, pianist, announcer and orchestra leader. The show was produced in 1933 and there are six shows available. If you want some extra romance in your life, try these shows: Heart's in Harmony, Linda's First Love, The Marriage, Romance of Helen Trent, Romance of the Ranchos, and Stella Dallas. Listeners may also enjoy recordings of Singin' Sam. Be the first to comment on "Vicks Romantic Bachelor"